The Presidency on Thursday said the Department of State Services had yet to brief it on a port worker, Moruf Ajao, who was allegedly abducted by operatives of the agency in the Aguda, Surulere area of Lagos State. The Senior Special Assistant to the President on Media and Publicity, Mallam Garba Shehu, told The Punch that he could not comment on the incident because he did not know the victim’s whereabouts. However, a senior official in the DSS said that the only chance of the family was to file for the enforcement of the victim’s fundamental human rights. He noted that things were not being properly done in the agency. The Punch had reported that 35-year-old Moruf was asleep with his wife and three children when the operatives scaled the fence into their house around 1.30am on Tuesday, March 6, 2018. The gunmen reportedly took him away without disclosing his offence to him or his family members. His wife, Mariam, said the family got to know that he was being held at the Lagos office of the DSS after the Lagos State Police Command, Ikeja, radioed security agencies in the state. 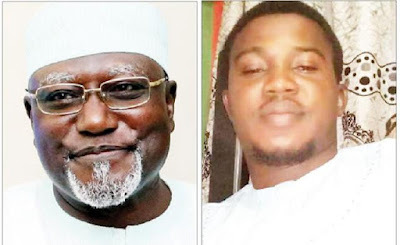 She noted that the leader of the Lagos DSS, one Mr. Wale, claimed that her husband had been transferred to Abuja, adding that checks at the Abuja offices of the DSS revealed the man was not truthful. A Lagos-based human rights lawyer, Femi Falana, had said the actions of the security agency were against all known laws of a democratic society. The Punch had reported the views of some Nigerians who condemned the action of the agency, saying it had taken the country back to the military era of disrespect for the rule of law and the constitution. The Presidency had promised to react to the incident on Thursday after being briefed by the DSS. But Sheu said he could not tell where Moruf was being held. A senior security official asked the family to hire a lawyer that could sue the DSS. “Will you take my advice? Let [his] family hire a lawyer and go to court to enforce his fundamental human rights,” he said. On March 8, 2017, Punch reported that a cleric, Pastor Ejimozor Williams, became blind and suffered a stroke after he was allegedly tortured by DSS operatives in Lagos. Williams was held incommunicado and allegedly tortured for three weeks. Although the allegation of being an accomplice in a fake-dollar case was thrown out by a Yaba Magistrate’s Court, the 47-year-old did not get compensated for his injuries. On August 17, 2017, Punch also reported the case of another cleric, Chisom Anaele, who was whisked away in a Jeep around 2am after his siblings were allegedly robbed of phones and money by the operatives in Abia State. He was allegedly arrested for a comment on Facebook. In all the cases, the DSS, which does not have a spokesperson, neither issued a statement nor apologised to the victims.